Definition at line 44 of file CCopasiObject.h. Definition at line 166 of file CCopasiObjectReference.h. Definition at line 174 of file CCopasiObjectReference.h. Definition at line 179 of file CCopasiObjectReference.h. Definition at line 190 of file CCopasiObjectReference.h. Definition at line 196 of file CCopasiObjectReference.h. Definition at line 198 of file CCopasiObjectReference.h. References CCopasiObject::getObjectName(), CCopasiObject::getObjectParent(), CCopasiObject::isValueBool(), CCopasiObject::isValueDbl(), CCopasiObject::isValueInt(), CCopasiVectorReference< CType >::mReference, CCopasiObject::ValueBool, CCopasiObject::ValueDbl, and CCopasiObject::ValueInt. Definition at line 215 of file CCopasiObjectReference.h. Definition at line 214 of file CCopasiObjectReference.h. Definition at line 224 of file CCopasiObjectReference.h. Definition at line 170 of file CCopasiObjectReference.h. 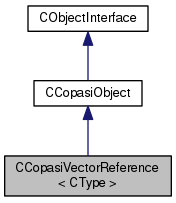 Referenced by CCopasiVectorReference< CType >::getObject(), CCopasiVectorReference< CType >::getValuePointer(), and CCopasiVectorReference< CType >::print().